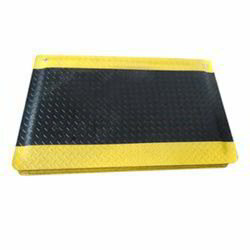 We are a leading Wholesale Trader of Anti-fatigue Mats from Bengaluru, India. Anti-Fatigue Mats are made from PVC + Foam. It improves comfort by reducing lower back and leg stress. Suitable for commercial Kitchen, Receptions, Sales and Cashier areas. Mat Size 2ft X 4ft,with Top Layer 2mm & Bottom layer 1mm. Structure: PVC sheet with foam sandwich. Recommend the use of Strength: Below weight 85 kgs ,standing time 10 hrs every day. Application: Can be used on both Wet and Dry Flooring.